We’d love your help. Let us know what’s wrong with this preview of The Miracle Morning by Hal Elrod. What if I told you that there is a "not-so-obvious" secret that is gu What if you could miraculously wake up tomorrow and any—or every area of your life was transformed? What would be different? Would you be happier? Healthier? More successful? In better shape? Would you have more energy? Less Stress? More Money? Better relationships? Which of your problems would be solved? What if I told you that there is a "not-so-obvious" secret that is guaranteed to transform any—or literally every area of your life, faster than you ever thought possible? What if I told you it would only take 6 minutes a day? Are you ready? The next chapter of your life—the most extraordinary life you've ever imagined—is about to begin. To ask other readers questions about The Miracle Morning, please sign up. so, having read the comments on this book and understood that the basis is to spen an hour first thing in the morning on meditation & exercise (physical, spiritual and mental/creative) can anyone tell me if I REALLY need to buy the book? Is this book has surrounded with affirmations principle? The Self Help Master List! The target audience of this book is someone who has never read any personal development books and views the whole genre suspiciously. For me, it smacked of a basic thesis, padded with a hasty potpourri of other people's ideas and coated with gushing "you can have the life of your dreams!" promises. I found myself having to skim through basic explanations of meditation and visualization to get at what Elrod was offering as far as original thinking. Get up an hour earlier. Do your face, teeth and drink a large glass of water immediately. Go into another room of your house (i.e. not your bedroom), and spend the hour doing the following: sitting in silence, say what you want to achieve and work on today, visualise how you want to live your day, exercise, read and journal. So the writing is cringeworthy (over-the-top internet self-help blogger), but the technique rocks. I've been doing it a week and it's been the most productive and fulfilling week I can remember. Having described myself as a morning person for a while now without really being particularly good at it, I'm excited to be back on the wagon. It's a fast read (easy to skim most of it) and only a couple of dollars on amazon. “How you wake up each day and your morning routine (or lack thereof) dramatically affects your levels of success in every single area of your life. Focused, productive, successful mornings generate focu If you're into stuff like this, you can read the full review. I'm going to do this review as a compliment sandwich. Good, bad, good. Hal Elrod seems like a genuinely nice guy with a dramatic and interesting message. He's a near-fatal car crash survivor who was brought back from death and put back together during a long hospitalization at the age of 20. His character trait of resilience really shines through in the anecdotes he uses to illustrate his points-- he is not someone who rolls over and gives up on anything, and for that I salute him. He's someone I'm going to do this review as a compliment sandwich. Good, bad, good. Hal Elrod seems like a genuinely nice guy with a dramatic and interesting message. He's a near-fatal car crash survivor who was brought back from death and put back together during a long hospitalization at the age of 20. His character trait of resilience really shines through in the anecdotes he uses to illustrate his points-- he is not someone who rolls over and gives up on anything, and for that I salute him. He's someone who would be an interesting person to know. This book talks about his discovery that getting up quite early and going through a predetermined routine improved his life. He adjusted his schedule to get up at 5:00am, then used that time for things like meditation, affirmations, reading, and exercise. The text details why this worked for him and for others, and lays out a plan step-wise on how to implement it in your own life. Now the bad stuff. First, I downloaded this to my Nook and was astonished that it is 490 pages long. That's a lot of information about an hour in the morning! Elrod's background is in multi-level marketing sales, and a LOT of the text reads like a sales speech. He introduces an element of the morning routine, then there are paragraphs selling it. Repeat, repeat, repeat. Without the sales pitches, this book could have been condensed to less than 100 pages of pure content. I've had the interesting experience of reading Nook books with live links to web content, and for the most part, that's a great way to present changing or frequently-updated content to the reader. So I was surprised when a portion of the program was available on his website rather than in the book, and that the Nook edition didn't provide live links! One chapter outlined a "packet" to download, then walked the reader through some of the elements of a 30-day challenge -- it would have been helpful to have that either in the body of the book or as a live link. Also, a caveat to not putting it in the book is that 20 years from now when someone reads this, that website may be long-gone, and with it, key elements of the author's content. - Very exaggerated way of writing. He could have done some of the chapters with 1/3 of the words. - First 20 pages are only testimonials. Very annoying you can skip that. - Tries to sell his 'starter kit' at least a dozen times in the book. What is this, weight watchers? Feels like my adblocker is switched off. - Half of the book is captain obvious. - The motivational way of writing ('YOU can do this!') is very repetitive and unnecessary. I really like this book. I've been an early riser for several years and have fallen off the wagon for several years. I always need a swift kick in the pants to motivate me. This is helping. My only reservation for this book is the use of the "95%" statistic. Every stat Hal gives is "95%". If you're going to give outrageous stats to motivate people it would be helpful if 100% of them were referenced and backed by actual scientific data. Other than that 95% of the book is worth your time. I thought I might do something a little different with this and, due to the nature of the book, instead of writing a standard review would instead chronicle how this has affected my life, over the coming weeks. As such, the rating may be likely to change. As a brief overview the central idea this book puts forward is that creating a daily personal development routine can turn you into the person you need to be to help solve all your problems. You have the power to develop into the person you need I thought I might do something a little different with this and, due to the nature of the book, instead of writing a standard review would instead chronicle how this has affected my life, over the coming weeks. As such, the rating may be likely to change. As a brief overview the central idea this book puts forward is that creating a daily personal development routine can turn you into the person you need to be to help solve all your problems. You have the power to develop into the person you need to be to create everything you have ever wanted in your life. This process begins from how you start your days. V - Visualise. A mood board of your dreams to help you better conjure them into reality. E - Exercise. Even if only for 10 minutes. An active body refreshes the mind. S - Scribe. This can be either bullet journalling your daily tasks or purging your thoughts in a diary-style entry. It's that simple. These six daily practises can help you to become the person you want to, and can be achieved in only one hour of time, each day. The year has just begun, and this is the second book that impressed me very much and deserves to claim the best book of 2018. The book is read very easily, many interesting facts, reflections on health, efficiency and vitality. The book encounters many useful links to other authors. An interesting moment for me is that most of the books that the author mentioned in his book read before and totally agree on all the points. The "Miracle Morning" book will help both "larks" and "owls" make your morn The year has just begun, and this is the second book that impressed me very much and deserves to claim the best book of 2018. The book is read very easily, many interesting facts, reflections on health, efficiency and vitality. The book encounters many useful links to other authors. An interesting moment for me is that most of the books that the author mentioned in his book read before and totally agree on all the points. The "Miracle Morning" book will help both "larks" and "owls" make your morning energetic, happy and full of joy all day long. While reading the book, I made markers on the pages and then I realized that almost all the pages had some marks and strokes. A lot of useful and interesting information. The book should be read several times. 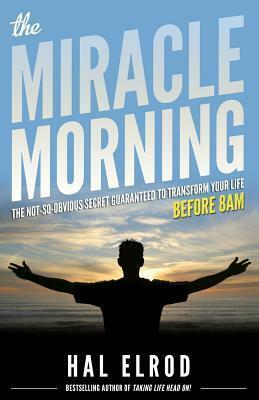 The most important thing after reading is to start using the "miracle morning" method in your life. - reading (20-30 min), read every day for at least 20-30 minutes. Personally, I like to do exercises for speed reading in the morning, and to read already during the day. I think this option is also suitable for a "good morning"
- you should have a diary, either online or regular. And every morning write anything, everything you want. If it's hard to write, just describe the day that has passed, the most interesting moments. Can write for what and to whom you are grateful. - exercise (20 minutes), do some exercises every morning. Remember the famous saying "if you do not find time for physical exercise, most likely to have to find time for illness. " Рік лише розпочався, а це вже друга книга, яка досить сильно вразила мене і заслужено претендує на кращу книгу 2018 року. Книга читається дуже легко, багато цікавих фактів, роздумів щодо здоров'я, ефективності та життєвої енергії. В книзі зустрічається багато корисних посилань на інших авторів. Цікавий момент особисто для мене, що більшість книг, які автор згадує в своїй книзі читав раніше і щодо всіх моментів повністю згоден. Книга "Чудовий ранок" допоможе і "жайворонкам" і "совам" зробити свій ранок енергічним, щасливим і сповненим радості на весь день. Читаючи книгу я робив помітки маркером і вже потім зрозумів, що майже всі сторінки мають якісь відмітки та обведення. Дуже багато корисної та цікавої інформації. Книгу варто читати декілька разів. А саме головне після прочитання - це розпочати використовувати метод "чудовий ранок" у своєму житті. - читання (20-30 хв), читайте кожен день мінімум по 20-30 хв. Особисто я люблю робити вранці вправи для швидкочитання, а читати вже протягом дня. Думаю, такий варіант теж підійде для "чудового ранку"
- письмо. Заведіть собі щоденник, будь-який - онлайн чи звичайний. І кожен ранок пишіть будь-що, все що забажаєте. Якщо важко писати, то просто опишіть день, що минув, найцікавіші моменти. Можете написати за що і кому ви вдячні. - фізичні вправи (20 хв), кожен ранок робіть зарядку. Пам'ятайте відомий вислів "якщо не знайдете часу для фізичних вправ", найімовірніше, доведеться знайти час для хвороб". I think this has been the fasted read I have had since highschool. Less than 24 hours. But that is not a compliment. The guy has a nice idea and a sensible self-improvement tool to offer but the essence of the book could have fit into half the volume of words or even less. It is repetitive. At several points I actually went back and forth a few pages because I though I'd accidentally skipped back on my reader. Add the pompous name, the excessive use of the word 'mediocre', the trademark signs ev I think this has been the fasted read I have had since highschool. Less than 24 hours. But that is not a compliment. The guy has a nice idea and a sensible self-improvement tool to offer but the essence of the book could have fit into half the volume of words or even less. It is repetitive. At several points I actually went back and forth a few pages because I though I'd accidentally skipped back on my reader. Add the pompous name, the excessive use of the word 'mediocre', the trademark signs every few pages, and the vague it-has-been proven statements and you will get why the whole thing sounds like a sales pitch. One that was meant to be heard, not read. Etant une lève-tôt convaincue, j'avais hâte de me plonger dans ce livre pour découvrir comment profiter au mieux de cette partie de la journée. A la fin de ma lecture je ressors plutôt déçue. L'histoire de l'auteur telle qu'il la présente au début est très intéressante et inspirante, c'est indéniablement quelqu'un de très positif avec une grande force mentale. Malheureusement on tombe vite dans les clichés du genre. Hal Elrod nous vante encore et encore les bienfaits de sa méthode, qu'il présente Etant une lève-tôt convaincue, j'avais hâte de me plonger dans ce livre pour découvrir comment profiter au mieux de cette partie de la journée. Malheureusement on tombe vite dans les clichés du genre. Hal Elrod nous vante encore et encore les bienfaits de sa méthode, qu'il présente comme révolutionnaire, miraculeuse et autres superlatifs en tout genre... Il y a énormément de témoignages de personnes ayant adopté sa méthode et qui ont vu leur vie changer du tout au tout mais sans plus de détails et c'est franchement lassant. Les idées lancées par l'auteur et la méthode des Life SAVERS est intéressante et plutôt pertinente au vu de ce qu'on sait sur les bienfaits de la méditation, des exercices physiques etc. mais j'aurais apprécié plus d'explications sur les différents points, plus d'exemples concrets au lieu de simples "Le Miracle Morning a changé ma vie ! Grâce au Miracle Morning ma vie est cent fois meilleure !". Par ailleurs, j'ai trouvé qu'il insistait beaucoup sur le côté compétitif : sa méthode permet de gagner beaucoup d'argent, de sortir de la "médiocrité" par rapport au reste des gens, qui eux n'utilisent pas le Miracle Morning (on appréciera le jugement de valeur émanant de cette idée qu'il répète pendant un chapitre entier...). Personnellement ce n'est pas du tout ce qui me correspond et je vois plutôt cette méthode comme du temps pour soi, prendre du temps pour l'introspection, la lecture, l'écriture et pour leurs bienfaits personnels mais pas forcément dans l'objectif d'être "mieux" que les autres. All those years of listening to Jim Rohn and Tony Robbins, here comes Hal putting everything together in such a simple and profound way that is amazing. As I grow older I realise that the simplest things create the biggest impact and the miracle morning seems quite basic until you try it. You are awake at 5 am while most people are asleep and the silence allows you to see the bigger picture of things that I couldn't see before as a night owl. your world is still asleep and hasn' Excellent book!!! your world is still asleep and hasn't got a claim on your attention. read the book, join the Facebook community and start tomorrow. Thank you Hal. God bless you. Read this in an hour because I skimmed through most of the pages. It didn't really give me any new information or useful tips. Most things seemed too farfetched and bogus claims.. anyway I read it and don't recommend it. Waste of the $5. A very compelling argument to wake up at 5am or about one hour before you usually get up, including weekends. This all makes sense and probably would make a great start to the day. I'm tempted to give it a go but personally would rather trim back most of the other ideas to 5 minutes each and give 30-35 minutes to exe A very compelling argument to wake up at 5am or about one hour before you usually get up, including weekends. This all makes sense and probably would make a great start to the day. I'm tempted to give it a go but personally would rather trim back most of the other ideas to 5 minutes each and give 30-35 minutes to exercise. The book is very compelling but at 150 pages is not concise and with such a narrow call to action - wake up early and do these things... It does repeat itself quite a bit. Just reread this book as I felt it helped my life back in 2013 but have been feeling a bit off track recently and life has changed a lot so it was time for bringing back some morning discipline! I find if I rush in the morning because I have gotten up too late or I am just too busy, my whole day is thrown off and even the rest of the week is out of whack. I have always found that easing into my day with relaxing routine in the morning gives me a good start. This book helped confirm that. We were Just reread this book as I felt it helped my life back in 2013 but have been feeling a bit off track recently and life has changed a lot so it was time for bringing back some morning discipline! The worst of its genre of personality-driven personal development books. Repetitive, poorly edited, entirely available for free without the constant onslaught of Hal stories. Seriously. Like 2/3 of this book was hearing how 1 hour solved Hal's depression. This is not wrong about what makes a successful morning. It's just packaged idiotically. The book was also a reminder of how little systemic injustice is accounted for in the white-guy-personality-cult-self-help world. All you have to do is tra The worst of its genre of personality-driven personal development books. Repetitive, poorly edited, entirely available for free without the constant onslaught of Hal stories. Seriously. Like 2/3 of this book was hearing how 1 hour solved Hal's depression. This is not wrong about what makes a successful morning. It's just packaged idiotically. The book was also a reminder of how little systemic injustice is accounted for in the white-guy-personality-cult-self-help world. All you have to do is transform yourself and then you can have wild success is a statement you can only make (and sell) from a position of extreme privilege. Mental health, racism, misogyny, all can be overcome in this one hour! This review has been hidden because it contains spoilers. To view it, click here. As the author of "The Miracle Morning" I have been blown away by the overwhelmingly positive feedback (300+ five-star Amazon reviews) and life changing results experienced by readers! See for yourself at http://MiracleMorningBook.com. Or get 2 FREE chapters of the book at http://MiracleMorning.com. Either way, please let me know how The Miracle Morning impacts YOUR life! Not sure why I picked this up-- perhaps just so many good things about it in the "ether"? perhaps a search to make things better? I am 100% behind the practices he recommends (well, maybe not to read self help books-- so make that 83% behind) though this presentation doesn't provide evidence (other than anecdotall) supporting them (needless to say, that's something of a frustration to me) but I find the tone difficult to deal with and it reads empty to me (though I admit, I'm in the minority here Not sure why I picked this up-- perhaps just so many good things about it in the "ether"? perhaps a search to make things better? I think this is the most typical 'self-help' book I've ever read/listened to. It reminded me of every American movie I'd seen where there was a motivational speaker gearing up a huge conference room of people. It did, however, really make me sit up and pay attention at points, and has given me a new idea of a way I can potentially improve my life and maximise my time. Hal Elrod's miracle morning isn't so much a genius idea as a great one that most people would probably want to actively avoid - ge I think this is the most typical 'self-help' book I've ever read/listened to. It reminded me of every American movie I'd seen where there was a motivational speaker gearing up a huge conference room of people. It did, however, really make me sit up and pay attention at points, and has given me a new idea of a way I can potentially improve my life and maximise my time. Hal Elrod's miracle morning isn't so much a genius idea as a great one that most people would probably want to actively avoid - get up earlier. Like an hour earlier than you normally would. As a somewhat early riser already (I get up at 6.30am every day for work, even when I'm working from home), this idea doesn't horrify me as much as it might other people who describe themselves as 'night owls'. But it is for a purpose. By getting up an hour earlier than normal, you can set aside time to do the LifeSAVERS - Silence, Affirmations, Visualisation, Exercise, Reading, and Scribing. Some of the LifeSAVERS I do already - I have finally broken through my rut with meditation and have been meditating for 10 minutes solidly every day since the beginning of the month. So that covers Silence. And I spend a large chunk of my morning reading, which is part of the reason I get up a lot earlier than necessary. But the others? Some I am just at a sticking point with, like exercise and scribing (in this case, journaling), and others I have never even considered to, or even scoffed at (affirmations and visualisation). The way Hal Elrod talks about his own experiences in this book, particularly the horrific car accident he was in where he almost died, fell into a coma, and was told he might never walk again - it really is inspiring. I found myself shocked and appalled at the story he was telling, and was immediately hooked. He has such a fantastic can-do attitude which really comes through in this book, and I like the way he breaks down all his points and all the chapters. I have now been avidly seeking out YouTube videos where people talk about their experiences trying out the Miracle Morning, and am really excited to start my own 30 day challenge in September for it. However, there are negatives to this book. Please bear in mind though that these are mainly to do with the audiobook. Firstly, there is the narrator - don't get me wrong, the narrator is great. He varies his voice a lot, and really makes you geared up to listen more. But he's not Hal Elrod. His name is Rob Actis, and I found it very bizarre that for a motivational self help book, the author himself didn't narrate the audiobook. I didn't notice this when I first ordered it from Audible, and for a while I thought I was listening to Elrod's voice, but when I discovered it wasn't I was definitely disappointed. My second negative is with the amount of selling in this book. Constantly Elrod tells us to go to his website and download various materials, and to join this or that community page, or even, and I kid you not, make his own 'Miracle Morning ENERGY Smoothie' (like this isn't a smoothie idea that anyone else could think up). And yes, these resources are free, but I did feel like I had a sales rep going on and on at me, desperately selling his brand. I've already committed to the book, you don't need to remind me constantly of the 'product' you're selling. I'm not sure if this would be less irritating in paperback form, but I did start to find it incredibly grating in the audiobook. However, overall I thought this was a great and motivating listen, and it's encouraging me to try and get my arse in gear and start doing all the things I constantly put off because I have no time. I just need to make more! Sofre dos mesmos problemas de outros livros de autodesenvolvimento, ou desenvolvimento pessoal, ou produtividade, ou qualquer outro nome escolhido para evitar a vergonha do termo autoajuda: o conteúdo principal do livro caberia em um capítulo, mas precisamos nos esquivar das dezenas de histórias de sucesso, elogios e as evidências de que esse é o melhor sistema do mundo para chegarmos ao que interessa. Além disso, não sou nem um pouco fã da motivação estilo The Secret (basta pensar positivo para Sofre dos mesmos problemas de outros livros de autodesenvolvimento, ou desenvolvimento pessoal, ou produtividade, ou qualquer outro nome escolhido para evitar a vergonha do termo autoajuda: o conteúdo principal do livro caberia em um capítulo, mas precisamos nos esquivar das dezenas de histórias de sucesso, elogios e as evidências de que esse é o melhor sistema do mundo para chegarmos ao que interessa. Além disso, não sou nem um pouco fã da motivação estilo The Secret (basta pensar positivo para sua vida mudar). O livro é naquele estilo "caí, quase morri, me reergui e agora estou bem melhor, há males que vem para o bem, você também consegue, veja como". Peguei o livro porque gosto de rotinas e a do TMM me pareceu legal. Se meu dia começa no improviso, rapidamente entro em uma espiral de preguiça e desmotivação, e acabo não produzindo nada. This was recommended to me. Honestly it's not the most well written book. It's very repetitive at times. BUT the principles it teaches are so worth reading about. I've started my own Miracle Morning routine and all I can say is on the days I actually follow it I get so much more done on those days. This is a quick read and it is free on Kindle Unlimited so to all who can access this for free you should definitely download it and read through it. the writing was a bit overdone, with some common success catchphrases and repested things over and over. That being said i cant argue with the results or message. Людина, здатна власноруч будувати омріяне життя. Яка вона і як нею стати? На це питання намагається відповісти Гел Елрод, переконаний, що змінивши вашу щоденну рутину - а саме прокидаючись у 5 ранку - ви зумієте досягти шаленого особистісного та фінансового успіху. Логіка така: хто рано встає, тому Бог дає. Чим раніше ви змусите себе вилізти з-під ковдри, тим більше часу у вас залишиться на саморозвиток. Для автора - це медитація, читання, позитивні твердження, візуалізація, письмо та фізичні впр Людина, здатна власноруч будувати омріяне життя. Яка вона і як нею стати? На це питання намагається відповісти Гел Елрод, переконаний, що змінивши вашу щоденну рутину - а саме прокидаючись у 5 ранку - ви зумієте досягти шаленого особистісного та фінансового успіху. Логіка така: хто рано встає, тому Бог дає. Чим раніше ви змусите себе вилізти з-під ковдри, тим більше часу у вас залишиться на саморозвиток. Для автора - це медитація, читання, позитивні твердження, візуалізація, письмо та фізичні вправи. Крім того, Елрод стверджує, що його книга допомогла тисячам людей стати успішними. Погоджуюсь, в книзі міститься безцінний досвід людини, яка пережила суттєву реабілітацію після жахливої аварії (11 переломів кісток, перелом черепа, шестиденна кома і тд), але той факт, що автор рекламує інтернет групи типу meetup.com і безліч книг із саморозвитку збиває спантелику. Повністю вся книга підкачала, схоже на лінивий копірайтинг: автор часто вдається до переповідання думок з інших книг, подає їхній список (реклама?) та пропонує лінки на вебсайти (наприклад BNI), які насправді не знадобляться кожному читачу. Мені не вистачило оригінальних авторських пояснень "свого" методу та логічних зв'язків. Не сподобались гучні заяви та авторська наївна самовпевненість, що ця книга, як ніяка інша, стимулюватиме вас до успіху. Чомусь мені здається, що існує набагато цікавіших книг, які занурюються глибше у вивчення тих чи інших проблем. So the premise of the book isn't a bad one. Wake up earlier, do you for an hour or so, then go about your day feeling better. That's been something I've been motivating myself to do for a while now, and I thought the book might inspire me to follow through. Boy did it... not do that at all. One of the first things author Hal mentions is that he was a salesman for a living. That becomes painfully obvious as the book goes on. Every shlocky technique is thrown at you and it makes for a tedious read So the premise of the book isn't a bad one. Wake up earlier, do you for an hour or so, then go about your day feeling better. That's been something I've been motivating myself to do for a while now, and I thought the book might inspire me to follow through. Boy did it... not do that at all. One of the first things author Hal mentions is that he was a salesman for a living. That becomes painfully obvious as the book goes on. Every shlocky technique is thrown at you and it makes for a tedious read. I found myself skipping ahead to more concrete tips, which were nothing revolutionary. Also, the author seems to know nothing about how the body works. "You only need as much sleep as you THINK you need!" Parts like that made me feel like I was reading a satire of the whole idea of a guru. I really hated that book. While reading, I imagined the author, not opening his arms looking at a sunset, but with a glittering jacket, a microphone, on a stage, with bright spots on him, willing to make me buy things I didn't need. Where was the well-being, the love, the kindness, the peace ? In the 5mn reduced to 1mn of meditation/silence/prayer ? Let's be clear, I want to be a better being, for myself, for those I love, for the world. I don't want to shout under the shower in the morning and en I really hated that book. While reading, I imagined the author, not opening his arms looking at a sunset, but with a glittering jacket, a microphone, on a stage, with bright spots on him, willing to make me buy things I didn't need. Let's be clear, I want to be a better being, for myself, for those I love, for the world. I don't want to shout under the shower in the morning and end up being rich and owning 5 houses. What on Earth would I do with 5 houses !!! I don't want to boast about having rich, famous friends, billionaires even ! I didn't have to buy a book to find out that if I want to find time for myself, I have to get up earlier, to exercise, to meditate, to have a little time for myself. I've been doing it for years. Si comme moi, pour bouger vous avez besoin que quelqu'un vous guide, ce livre est fait pour vous. Profitez d'une heure par jour pour vous, pour enfin vous accomplir. Rien de bien nouveau dans le monde du développement personnel et du coaching , la différence réside dans le fait que Hal Elrod vous fait vous lever plus tôt. Aller j'arrête de traîner, demain matin une heure pour faire du sport, créer, lire et penser à mon avenir. Et si cette heure change ma vie, je viendrai vous le dire! От доста време насам исках да прочета за популярното движение - ставане в 5 АМ и да ползваш времето си за добър старт на деня. Доста търсих и проучвах докато разбера, че от тази книга е тръгнало всичко. Книгата не е лоша, но при мен имаше обратния ефект - вместо да ме надъха, тотално ме депресира. Книжката е много малка, всичко е малко твърде хаотично вътре и се повтаря до втръсване. Личи си, че авторът е работил дълги години в сферата на продажбите, защото този стил на изразяване ми се струва т От доста време насам исках да прочета за популярното движение - ставане в 5 АМ и да ползваш времето си за добър старт на деня. Доста търсих и проучвах докато разбера, че от тази книга е тръгнало всичко. Книгата не е лоша, но при мен имаше обратния ефект - вместо да ме надъха, тотално ме депресира. Предполагам, че не ми допадна "препускането", тъй като си падам по по-плавния, да го кажем дзен подход към нещата. А и макар на места да споменаваше, че човек ще има трудности и препятствия пред себе си, те бяха толкова милолетни споменавания и веднага бяха заменяни от гръмки думи, че няма вариант да не се получат нещата, че се дразних през ред на написаното. Предполагам, че книгата не ми допадна именно, защото аз обичам по-различен тип книги за усъвършенстване, но от всяка книга има какво да научим и да си вземем. С тази също беше така, тъй като имаше някои наистина добри моменти, а и най-после научих какво всъщност е miracle morning, което отдавна исках да разбера.